Master and Man Research Papers look at a trip of a man and his servant to a distant village to purchase land. 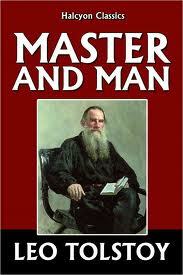 Research papers on novels by famous authors such as Tolstoy or Steinbeck can be custom written at Paper Masters. By focusing on a story like Master and Man, our researchers can explicate any form of Russian literature you need discussed. World literature is our specialty at Paper Masters and we gladly help write any research paper needed. The elements of nature to help propel Vasily and his servant on the road towards this transformation. Tolstoy contrasts and opposites are also minor themes within the story - such as a wealthy merchant and a poor lush of a servant teach each other important lessons in life. The plot of Master and Man revolves around the trip of Vasili Andreevich Brekhunov and his servant Nikita to a distant village called Goryachkin to purchase land. The weather is poor and snow makes traveling difficult. Soon the two travelers lose their way and it becomes questionable if they should continue on with the trip. Vasili’s greed forces them on while Nikita knows that it is unwise yet he can say nothing because of his position as a servant. Vasili and Nikita are at opposite ends of the social ladder and each are ruled by what holds them in that place – Vasili by the desire not to be shown up by his upper class rivals forces him to continue the trip out of pride and greed; Nikita must obey his Master and, even though his common sense tells him he is being unwise, he is driven on by his position of obedience. The relationship between the Master and Nikita is one of a dominant and overbearing employer and a poor desperate employee. Vasili knowingly cheats Nikita out of money and wages while Nikita is in no position to argue with his Master due to his social position and poor living circumstances. The story comes to a climax when the two are hopelessly stranded in the cold and blowing snow. The Master is warm in his rich clothes and Nikita is slowly freezing to death. As Nikita begs the Master to give the money owed to him for his service to his son after his death, the master has a revelation that brings about spiritual transformation. Vasili lays down on the body of his worker and wraps him up in the flaps of his coat, bringing him back from the brink of death. This rescue brings Vasili’s first experience of true joy. The next morning, rescuers find the servant alive and the Master dead. Leo Tolstoy Biography - A research paper on a Leo Tolstoy biography discuss a writer commonly known as one of the greatest Russian writers of all time. The Brothers Karamazov research papers look at the novel by Dostoevsky and often compare it to his classic Crime and Punishment. A Problem by Anton Chekhov - “A Problem” is a short story by Russian author Anton Chekhov. The story concerns what happens when a forged IOU note affects a family. The Bear by Anton Chekov - The Bear Anton Chekov research papers examine the comedic one-act play written by Russian dramatist Anton Chekov. Anton Chekhov - Anton Chekhov research papers look into the life and career of the Russian writer of plays and short stories. Mikhail Bakhtin - Associated with the Russian Formalist School much of Bakhtin's work was unknown outside of the USSR until after his death. Catherine The Great And The Russian Nobility Research Papers evaluates the relationship between Catherine and nobility. Paper Masters writes custom research papers on Master and Man and look at a trip of a man and his servant to a distant village to purchase land.